Luminous intensity, luminous flux, illuminance, exitance and luminance are all terms you have probably heard when talking about lighting, but what do they all mean and what do they all measure? People who have been in the industry for years still struggle to understand these terms so it is alright if it all sounds a bit confusing at first. Let’s dive straight in and try explain them as simply as possible. Intensity is often equated to how ‘bright’ a light appears. It is measured in candela (cd), and like the name suggests it was originally based on, yes you guessed it, the brightness of a standard candle. Luminous Intensity measures the amount of light emanating from a point source within a solid angle of one steradian (sr). Now all you need to understand here is firstly, it is a measurement from the source of the light and secondly, it is a directional measurement. Think of a narrow funnel protruding from the light source. Luminous Flux is often the most common measurement used to compare different light sources and can usually be found written on the box or in the data sheets of most lamps. Its unit of measurement is the lumen (lm) and is defined in terms of candela sterdians (1 lm= 1 cd.sr). 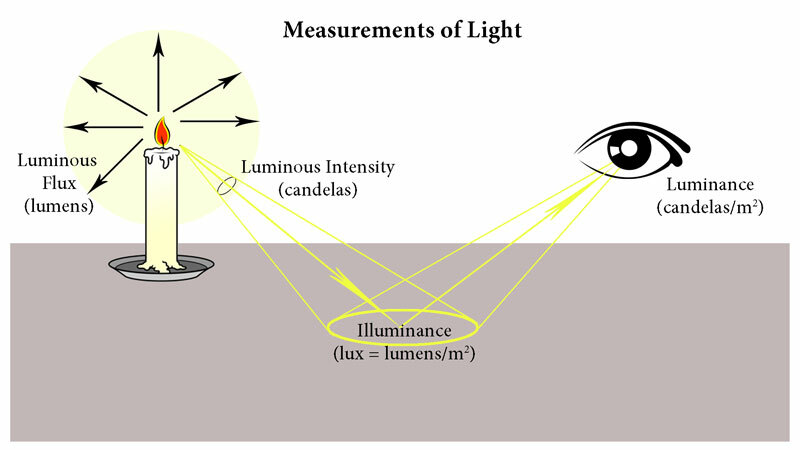 The difference between Luminous Intensity and luminous flux is that luminous flux is used to measure the amount of light emitted in ALL directions. Think lots of funnels protruding in every direction to create a whole. The illuminance is the total luminous flux or quantity of light falling on a unit area of a surface. This makes more sense when you look at the unit of measurement which is lumen per square meter commonly called lux (lux = lm/m2). Because it is a measurement from the source of the light, the luminance is independent of the type of surface. Think of a photographer in a studio holding a light meter in front of his subject. This is the light that WOULD fall on the surface no matter how well or badly that surface reflects the light. This measurement is useful because working conditions are of often specified in lux. For example factory workers working on visual tasks with very small or low contrast objects will need between 2000-5000 lux to perform their tasks effectively and avoid eye strain or injury. This term is not widely used but is important to understand in order to understand the next and most probably the most important measure of light. We now look at the reflective properties of the surface or how much light is coming off of this surface in all directions. Would a white card or a black card reflect light the same way? No, the black card absorbs light (reflects less) whereas the white card reflects light (absorbs less). In other words we would have more light coming off a white surface. Exitance is measured in lumen per square meter (lm/m2), just as we measured illuminance. It tells us how much a surface diffuses light. Now think of that light bouncing off that surface and into the eye or camera. This is how we see. We actually see by processing the light that is reflected off the object or surface we are looking at. Luminance is the intensity of a light emitting from an object or surface and not from the source. The key words here are object or surface. Different surfaces reflect light differently. A mirror and a white card have different reflective characteristics and create very different effects. They may have the same exitance, but the way the light comes off of these surfaces can be very different. Luminance is therefore a function of the specular of the surface and not the diffusion properties of the surface (exitance). If this all sounds a little confusing, look at the unit of measurement. Luminance is measured in Candela per square meter (cd/m2). What can we deduce from this? Remember candela is measured in a specific direction, unlike lumen. Think of the funnel. Wattage, contrary to popular belief, is not a measurement or even an indicator of light output. It is simply a measurement of electrical power. While on the topic of wattage, it is important to note that as LED’s become more efficiently designed, the wattage is often reduced as the lumen output is kept the same.